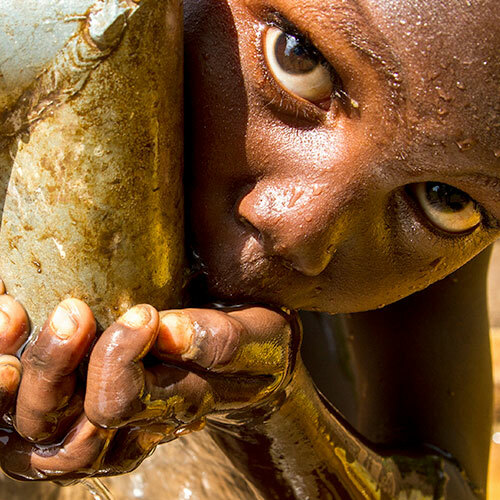 Marakera, an Ethiopian 5-year-old boy, drinks clean piped water. Photo UNICEF Ethiopia/Ayene. Access to water and sanitation is a precondition to life and a declared human right. Water is vitally important to sustainable development – from health and nutrition, to gender equity and economics. Over the coming years, our water-related challenges will become more urgent. The increasing demands of a growing population and rapidly developing global economy, combined with the effects of climate change, will exacerbate lack of access to water and sanitation for domestic uses. In fact, many experts argue that an unpredictable supply of water could constrain socio-economic progress in the future. In order to accelerate efforts towards meeting water-related challenges, the United Nations General Assembly declared 2018-2028 as the International Decade for Action “Water for Sustainable Development”. The Water Action Decade will commence on World Water Day, 22 March 2018, and will end on World Water Day, 22 March 2028. The objectives of the Decade focus on the sustainable development and integrated management of water resources for the achievement of social, economic and environmental objectives and on the implementation and promotion of related programmes and projects, as well as on the furtherance of cooperation and partnership at all levels in order to help to achieve internationally agreed water-related goals and targets, including those contained in the 2030 Agenda for Sustainable Development. The Decade also highlights the importance of promoting efficient water usage at all levels, taking into account the water, food, energy, environment nexus; and stresses the importance of the participation and full involvement of all relevant stakeholders, including women, children, young people, older persons, persons with disabilities, indigenous peoples and local communities. Help inspire action to achieve the 2030 Agenda by joining thousands of other people on World Water Day (22nd March) and World Toilet Day (19th November) to raise awareness of the water and sanitation crises and exert public pressure for change.